In this video, I show how easy it is to use RC servo in Lego environment. Note that the axis of a joint must never be directly attached to the axis of the servo to avoid lateral forces. I have just discovered and ordered this. The servo has Lego compatible cross-axle as well as studs and holes. I plan to test it in some low-torque applications controlled by Arduino. I have ordered them too. I have seen these too, but how is the servo output lining up to Lego? The Geek KittenBot servo has not very good 3D alignment with Lego, but you can adapt it easily. 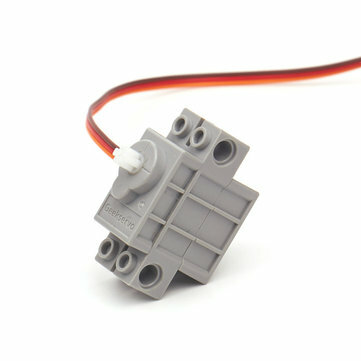 In this thread, https://www.eurobricks.com/forum/index.php?/forums/topic/169482-brick-compatible-kame-quadruped-robot/ you can see how I made a Spider Bot with this servo. To do that, you hold this bush between two fingers and pass it on a little saw blade.